It is becoming one of my little annual traditions to cycle up to Col de Joux Plane and then cross-country ski from the col. The Morzine side of Joux Plane will be closed probably until May, it’s a ski slope. But the more famous Samoëns side is often open in winter, especially in warm weather, to facilitate XC skiing. This is my 4th consecutive year doing this. 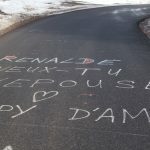 The other three were in March but it’s been very hot in the Alps recently and despite the “Closed” sign in the photo below (less than half way up), I was confident the road would be cleared to the Col.
It’s a beautiful climb that has a reputation for being perhaps tougher than its stats. I believe this is because it is so uneven. Sometimes 4% grade, sometimes 14%. Lots of hairpins, but it is not a purpose built, modern road but instead meanders up the mountain. Absolutely no snow until I was within 3 kilometres of Col, but lots of snow covered peaks. 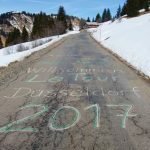 Col de Joux Plane was the final major climb of the 2016 Tour de France, so there was plenty of road graffiti to enjoy. There was so little snow, and it was so warm that even when I was within a kilometre of the Col, I expected the cross-country skiing to be closed. But in fact, the conditions were pretty good, if warm snow. I was thrilled to see they have expanded the area. 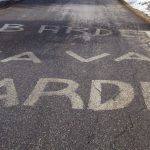 At least I don’t ever remember seeing signed/groomed trails in the direction of Ranfolly – following the paved road. Very nice. I was in no hurry and did another loop, this time up to Croix de Mapellet (see map). At 1770 metres this was my high point for the day. The views of the Mont Blanc Massif on the way to the Croix are truly great. In summer, there are lots of great routes that can include Joux Plane. 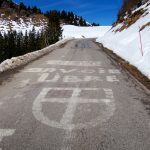 In fact, with some careful mapping, one can make a loop with any combination of Col de la Joux Verte, Col de la Ramaz, and Col de l’Encrenaz. Here’s a loop with all of them. Col de Joux Plane is a fun, interesting cycling climb. Not bad. But when combined with winter views and some superb cross-country skiing at the top it makes for a perfect outing.